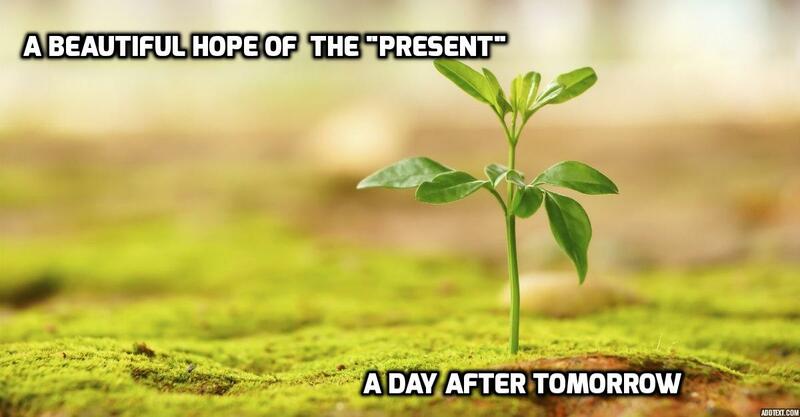 Beautiful hope of "The present"
A day after tomorrow. A day in the womb of future, thriving with an adorable feel of happenings, events or a complete change of an environment and stars of the universe. A day after tomorrow, whose welcome ceremony is being planned by the present with a great excitement and energy with an added eagerness to devise it. A present is getting decorated to prepare an event to get A day after tomorrow the most outstanding occurrence. After all, A day after tomorrow is the glorious future of the present. The present is just like a child ready to go to school for the first time in his life. How beautiful that emotion and feelings are to have the first experience to get yourself a new form of life. The same feeling is the one which A present is right now experiencing. If someone will tell you that from tomorrow you will be having new glamorous life which will fill the beauty of happiness in your pocket, you will feel like that one favorite toffee inside your pocket which your mother were used to keep secretly to surprise you. The same is the feeling of that “A day after tomorrow” for the present with a little soft palm which is going to be filled with some little amount of tiny happiness. That tiny palm of present is eager to prepare for A day after tomorrow. Whether it is going to be a small happening or any big event, the cute little present is always so much hopeful for that special eve of A day after tomorrow. Whether you give a big tasty choc o-pie or a tiny chocolaty toffee, The autumn of happiness will never look for your amount of contribution, it will shower on you equally. But who cares about that shower of ecstasy? The cure little hope of an innocent child “present” i.e. A day after tomorrow, often gets crushed by a storm of sorrow! The whole set of starts gets spread around and nothing remains at the prime time when the present born as A day after tomorrow. A cute little baby like a part of that innocent tree who always expands itself to give a cool shadow to others, get his shower of ecstasy diminished by the giant scary storm of sorrow! Nothing is left behind that want to be shiny start of A day after tomorrow, but a burned coal of sadness unveiled by that scary storm of sorrow! Hello, I am Niket. I am a writer probably a creative creature who always be with his own imaginations. I love to write and that's why i am writer for myself. I hope that my writings will one day reach to world to help them to break all traditional bonds and be the Architect for their own life. Come have a journey of my creative world with me to design your own life filled with colors of happiness you wanted always.